I’ve always loved libraries…and librarians. It started in my elementary school, even before I fell in love with reading. A room full of books – many of which had pictures! At first, it was just the picture books that drew me in but once I started reading, I just couldn’t stop. When I learned that there was an even bigger library than the one in my school, I was elated. I checked out as many books as I was allowed and churned through sometimes one or two books a day, and even more in the summer. So around the time the time the writing bug bit me, I decided that a real writer should probably work in a library, surrounded by books. At the age of fourteen, I started showing up at the Enumclaw Public Library, filling out applications regularly even though the librarian told me (in a very friendly but quiet voice) that I had to be sixteen to work for the library. Still, I was back every so often to try again. For two years. Persistence paid off and when I turned sixteen, I started working as a library page, shelving returned books and doing whatever odd jobs needed doing. It was Heaven. No fines for late books and at the front of the line for anything new and exciting to come in. And pick of the litter when it came to books being disposed of. I still have some ancient volumes of Shakespeare in my personal library from that time. Yes, I’ve always loved libraries. Which is why, on the first page of the first chapter of my first novel, I blew one up. And somehow, despite this, the American Library Association put that first novel, Lamentation, on the RUSA Reading List for Best Fantasy. Maybe it’s because of how seriously my protagonists took this devastating act of terror and the hole its destruction left in their world. Or maybe because re-building the library became an important aspect of the story. No matter the reasons, I’ve had a lot of support for the series from libraries and librarians and I’m glad for it. When I conceived the notion of the Great Androfrancine Library, it was initially just the background for a short story. It wasn’t until I started stitching together the two stories that became the beginning and middle of Lamentation that I saw clearly the re-building of the library – or the notion of a hidden replica of the library. I was drawing a bit from the murky soup of history – the destruction of the Library of Alexandria in Egypt, which is not quite as easy to pin down as legends would have us believe. That library appears to have gone through a series of events that eventually led, over time, to its loss. In reality, no one seems certain exactly what happened and when though speculation points widely to various events between approximately 50 BCE and 650 AD. But in my world, I wanted it gone quickly, along with its Androfrancine keepers, and I wanted to explore how that kind of loss would play out while my characters sought to solve the puzzle of who destroyed Windwir and why. The “light” of human knowledge and accomplishment, dug painstakingly from the ruins of the Old World and stored away for safekeeping, suddenly snuffed out, and the glue that held a carefully monitored society of survivors suddenly burned away. And there’s a deeper exploration there: What happens when one group of people controls the flow of knowledge and what happens when another group takes away that knowledge? 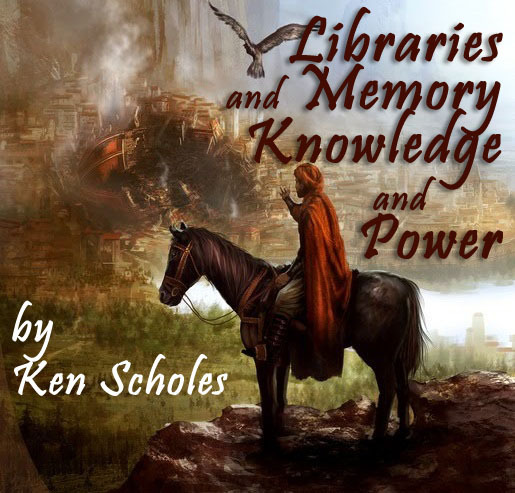 Because knowledge is power but it is also memory. And if you control or eliminate that memory, the river of history flows in favor of whichever group holds that power to impose their own recollection of how things are and should be. As we progress deeper into the Psalms of Isaak, we see that it’s about much more than a destroyed library – it is about a sudden and unexpected war of cultures with blurry lines of motivation and intent on both sides. And moreso, it is about how people react to those sudden, violent changes. So like I said, I love libraries. And librarians. I think the world is a darker, colder place without what they do for us. So I’ll try to go easier on them in my next series. 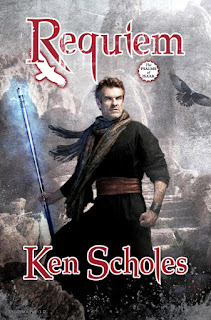 KEN SCHOLES is the author of the acclaimed series The Psalms of Isaak, which comprises Lamentation, Canticle, Antiphon, and now Requiem. He lives near Portland, Oregon, with his wife, Jen West Scholes, and their three-year-old twin daughters. 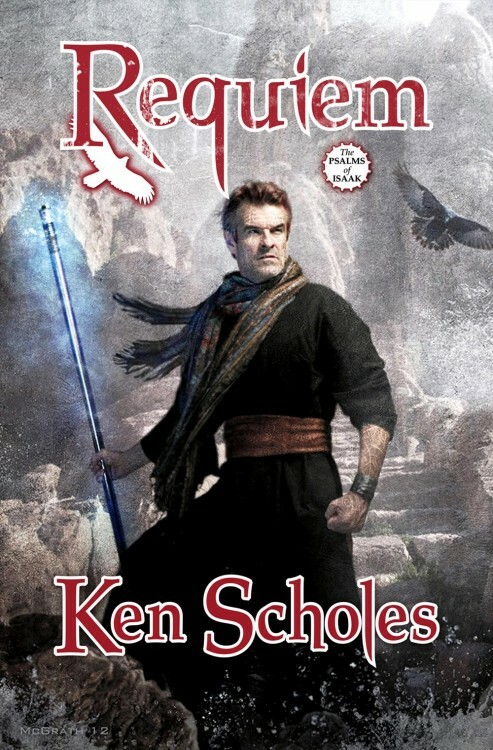 Visit him on the web at www.kenscholes.com.